Tips & Treasures: Bloggers Sign Up: Tip Hero's New Year's Kickoff Giveaway! Bloggers Sign Up: Tip Hero's New Year's Kickoff Giveaway! Are you a blogger? Would you like to increase your social media following? 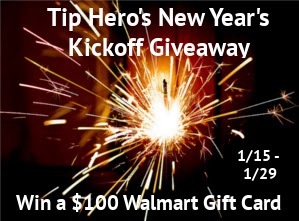 Sign up to participate in Tip Hero's New Year's Kickoff Giveaway!